This exercise from The Four Virtues will help you let go of fear and resentment to make room for positive new experiences and emotions. At New Year’s or a birthday, or maybe just at the end of the day, we can ask ourselves to name or write down privately what we want to hold on to (a memory, a bit of insight, even a possession) and what we want to let go of (a frustrating event, anger, hurt, or some possession that we really do not need any longer). Perhaps we put this note of what we want to let go of in an envelope, seal it, decorate it, and, with the appropriate weight and fanfare of ceremony, shred or burn it. We might be reminded of nature cleaning itself out each year with the change of seasons—how trees have to let go of their leaves in order to grow new ones and how what is left behind becomes compost for creation. It is amazing how we hold on to resentments, fears, and other ideas that clot consciousness. Instead, we can get into that natural rhythm of constructive surrender that frees us for new delights. 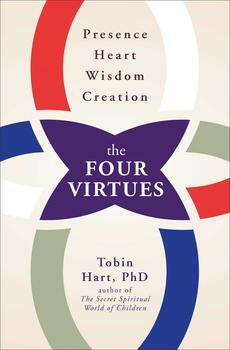 By drawing from across tradition and time, from neuroscience to ancient wisdom, Tobin Hart reveals that we all possess four essential virtues—Presence, Heart, Wisdom, Creation—that help us to build, balance, and integrate our psychological and spiritual life on earth.